Think back on the last time you found yourself in a dark room surrounded by prehistoric dinosaur bones and artifacts. Our best guess would be that this was a family outing to a natural history museum. And most likely you spent a considerable amount of time reading plaques written with cursive lettering and saying “huh, that’s interesting…” – but experiencing the artifacts come to life in any meaningful way? Probably not. Imagine on the other hand, looking at a T-Rex skeleton through a window and seeing a raptor sneak out from the corner of the room and charge towards you. Couple that with the fact that the raptor is three dimensional, life sized and covered in scaly skin. Now that’s an experience that will leave a lasting impression, and that’s what guests experienced when Animmersion took viewers into the prehistoric world on a journey through five hundred and seventy million years of Earth’s history at the Hancock Museum in Newcastle in association with the Great Exhibition of the North. You can imagine how children experienced this. says Managing Director of Animmersion Dominic Lusardi. The Great Exhibition of the North was an 80-day festival, which comes around every 50 years, and aims to identify the character of people and cultures of the North. During the summer of 2018, the festival was held in and around Newcastle and Gateshead, UK and drew large crowds of people from every corner of the world. 1.300.000 visitors came to Newcastle solely to experience the exhibition and its events. 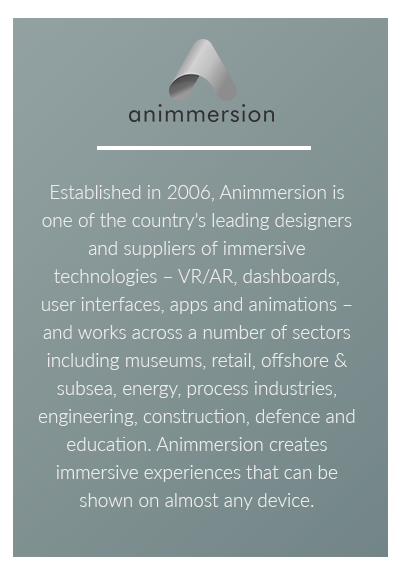 Animmersion, was commissioned by the Great Exhibition of the North and Tees Valley Combined Authority to showcase the forefront of immersive technology in three different locations including the Hancock museum, the Sage Gateshead, and the shopping mall Eldon Square. If you’d visited the mall at Eldon Square this past summer, you probably encountered a scene of curious couples standing on tiptoes and kids pulling at their parent’s jackets in an attempt to get a glimpse of a virtual car showroom exemplified by a Mercedes floating and twirling on a dimly lit backdrop. You can imagine how this could change people’s experience at the mall. Animmersion’s aim was to showcased how car showrooms could look into the future. Animmersion created the 3D installations with the use of DeepFrame. “the DeepFrame lets us make our visualisations much bigger and creates an immersive window into the digital world. The DeepFrame is a semi-transparent optical lens that can be integrated into most structures, and makes it possible to experience digital objects of any size in the real world without the need for the user to wear any external device to experience the effect. Animmersion showed great results in the wake of the festival. 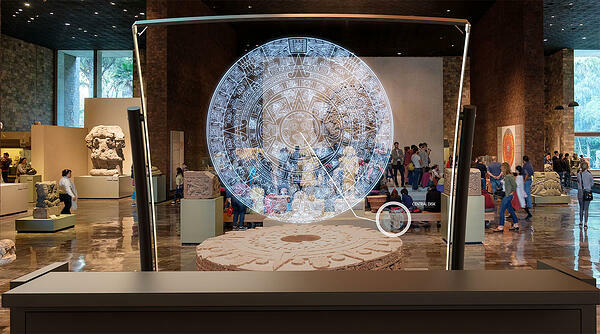 The immersive installations managed to increase footfall in the retail location and attracted more visitors and increased the time spent in museums. For Dominic Lusardi, the event was not only a stepping stone for the company, but a pivot point for the whole region in the UK. The event presented a chance to shine and move the spotlight from traditional tech hubs like London. “Everything is London-focused, but this has shown that immersive technology is to be found in the North. It has put a spotlight on the product, area, and company. Everything that is otherwise hard to do. This has branded us and the north,” says Dominic Lusardi.